Aristide Tarnagda, artistic director of the Récréâtrales Theatre Festival in Ouagadougou, Burkina Faso, began his work in theatre in 1999 as an actor before moving on to explore playwriting. Over the years, he has developed his craft at a number of residencies in Africa, Canada, and Europe, where his work has also been read and produced. During the 2018 PEN World Voices Festival, the Martin E. Segal Theatre Center presented my English translation of Tarnagda’s play Façons d’aimer (Ways of Loving). 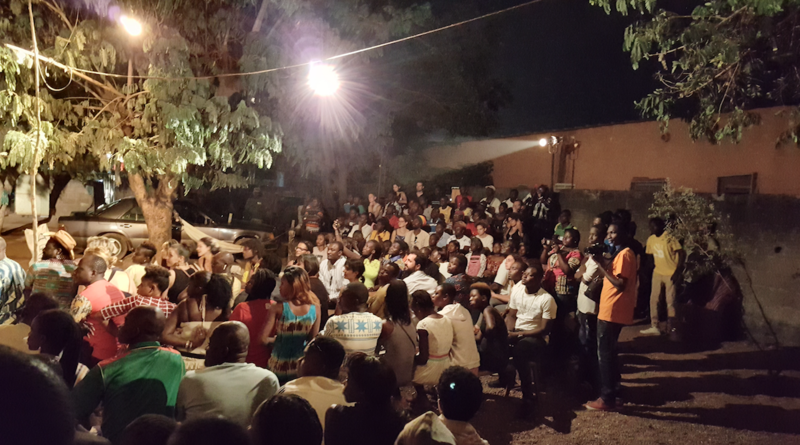 After the reading, I sat down with Tarnagda to talk about his work as a playwright, the inclusion of women in Burkinabé theatre, and the role his biennial festival plays in Burkina Faso. Founded in 2002, Les Récréâtrales takes place in a residential area of Ouagadougou. Plays are developed, rehearsed, and performed in family courtyards, bringing theatre to the people. Whereas non-festival performances at downtown cultural centers like the Institut Français or the Espace Culturel Gambidi attract audiences composed of Europeans, other artists, and the artists’ family members and friends, the festival’s audiences are locals of all ages who would not usually have access to or interest in theatre. Heather Jeanne Denyer: Since you started writing plays in 2004, you’ve been quite prolific. Would you say you can’t not write? Aristide Tarnagda: No, it’s not possible. Writing isn’t a luxury for me. It’s linked to the need to procreate—to put myself out there in the world—and the need to bear witness to the power and the lack of power of my country, of its dreams. As a writer, I have the obligation to participate in the writing of my country’s history. Heather: You would say that you are a Burkinabé writer above all, then. Heather: Not a global writer. Aristide: A global writer, yes, but first of all, I come from somewhere specific. To quote Joseph Ki-Zerbo: “The universal isn’t in the clouds, it’s on the earth.” It’s because I am Burkinabé that I am global. I introduce myself as a Burkinabé writer because the roots of my writing are there. A lot of things can influence us but our inspiration comes from where we live: Who are the people from my neighborhood? What is the landscape of my town? Its roads? The dust of Ouagadougou…? It’s the collection of physical things, material and immaterial. A lot of things can influence us but our inspiration comes from where we live: Who are the people from my neighborhood? What is the landscape of my town? Heather: I also pick up on the influence of music in your work. Aristide: If I dive way, way back in my childhood memories, I have always loved the traditional music of the country. I wanted to be a musician. I was always taking part in local festivities with musicians and dancers. With the Bissa [a Mandé ethnic group numbering around half a million in Burkina Faso], there is an instrument that accompanies the guitar, the sissiga. I played that when I was little. So music has been present my whole life. Heather: We can see that clearly with the presence of musicians onstage alongside the actors in your plays. In Façons d’aimer, performed at Les francophonies in 2015, a musician, David Malgoubri, accompanied the two actresses, Safourata Kaboré and Lionelle Edoxi Gnoula. Likewise, there were musicians in a lot of the productions at the 2016 Récréâtrales Festival. Let’s talk about the festival, which plays an important part in your artistic life. Aristide: The Récréâtrales is very important because an artist, in order to grow and go further, needs a space to practice. That’s really been neglected in Africa—the spaces that allow for refinement and growth and discovery are very, very rare. So the festival is a useful tool because it provides support for artists as well as a showcase. It allowed me to really be able to sit down and calmly draw my own path. The festival was just like others before it became an event with a unique identity. The entire process of creation takes place before the spectators’ view—they are witnesses to what is happening. They bring something to the creations. This is extraordinary, because who do we make theatre for? We do it for the people. 2015 production of Façons d'aimer as part of the Les Francophonies en Limousin annual festival in Limoges, France. The actresses pictured are Edoxi Gnoula and Safourata Kaboré. Photo by Christophe Péan. Heather: They observe every level of the development, not just the end performance. Aristide: Yes. But to quote Saint-Exupéry, “Self-discovery comes when man measures himself against an obstacle.” It’s something rather heartening because you draw energy and enthusiasm from the faces of the children who are there, watching; from the women who are there. You feel the wonder I’m talking about in them. They live the beauty. And you suddenly understand that it’s all necessary. Heather: These aren’t ordinary audience members who would normally go to the theatre. Aristide: Voilà! And that is awesome. Heather: When I discuss the problem of a lack of audiences with artists in Benin and Togo, people often speak of the need to create a new generation of audience members who get used to going to the theatre, because if it isn’t a habit from a young age they’re never going to start. Do you think the festival helps do this? Aristide: Of course. It’s the act of creating a community that’s important. After all, there are three thousand audience members a day during the festival. Heather: Do you think that helps change the general mentality about the importance of theatre and art? Aristide: Oh yes! And we can already see it working. The view of the spectator is established: a point of view, a critical perspective. People start to give their opinion on a performance. People start to become discerning. And that’s how this theatre is political. Then, once people become engaged, they become the theatre audience. That’s how it’s built—it’s contagious: it spreads to others, and, finally, it spreads to the entire city. Heather: Do you make a conscious effort to address political topics in your plays to open up discussions? Aristide: Yes, theatre is a social discussion. When you write a play, it’s the pretext for gathering with a view to exchange ideas. It’s in speaking about our realities that we can transcend them. We create a community, and, above all, we create connections between people. In order to promote people coming together, it’s essential that theatre is about them, that it interests them and speaks to them. For example, with my play Sank, ou la patience des morts (Sank, or The Patience of the Dead), it was fundamental for me to interrogate the history between the former socialist head of Burkina Faso, Thomas Sankara, and his brother-in-arms/assassin/successor, former president Blaise Compaoré. As a writer, I had the duty to examine this and share observations with the people of Burkina Faso, and then with the rest of the world, so that we could analyze our history and take charge of it. 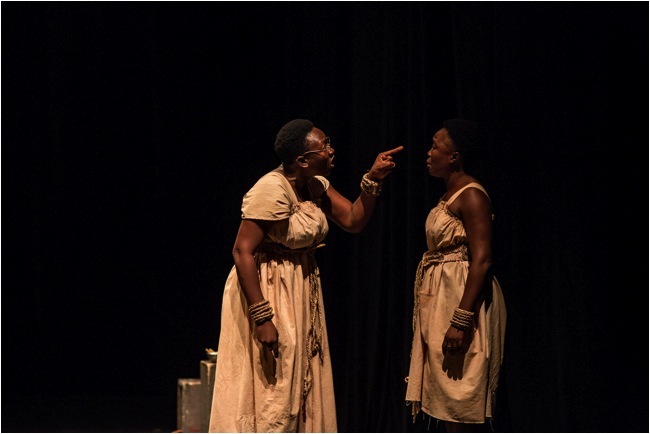 Heather: I would add that Terre rouge (Red Earth), which is a conversation between two brothers through letters—one who has left for Europe and the other who remains in Africa—is also a political play. Aristide: I always like to blend the intimate and the political. Because the intimate allows an opening up. Terre rouge is about two brothers talking to each other. Most people have brothers and sisters, so they’re already invested in what’s being addressed. In a way, it’s as if we are telling stories that involve the audience, stories they see themselves in. When you write a play, it’s the pretext for gathering with a view to exchange ideas. It’s in speaking about our realities that we can transcend them. Heather: On the other hand, plays like De l’amour au cimitère (Love in the Cemetery) or Et si je les tuais tous, Madame ? (And If I Killed Them All, Ma’am?) are more generalized, even if they also start conversations. They speak of human relations, life and death, with a certain urgency, even if the details of location and character are not as precise as in Sank. Aristide: It’s not the destination that is important, it’s the path. It’s the here, the now, that interrogates and captivates. I’ve always anchored my characters in dire situations where they have to make tough choices, where they have to define themselves and take charge of their own fate. They can’t be indifferent. I mean to say we can’t be an observer, a spectator, of our own life. Most of the time things end badly in my plays. No happy endings. But that opens up a field of possibilities, a field of discussion, a field of complexity. Heather: That’s clear in Façons d’aimer, which focuses on a woman who addresses her judge as she stands trial for murdering her husband and his fourth wife, a white European woman. The play is political both because the protagonist is a murderess and because she is a left-handed woman, which is a traditional taboo. She is also a metaphor for Burkina Faso, as a country, and for all Burkinabé women. And yet both the protagonist and her mother are much more complex and individualized characters than most female characters in earlier Burkinabé plays. Actresses used to only play “wife” or “mother,” which didn’t allow for social issues relevant to women to be addressed in theatre. But your theatre is helping address this today. Aristide: The situation in which Burkinabé women find themselves is exactly the situation of our various African countries. These are deconstructed, lost countries in the process of rebuilding themselves and redefining their symbols, values, and spirituality. The situation in which Burkinabé women find themselves is exactly the situation of our various African countries. These are deconstructed, lost countries in the process of rebuilding themselves and redefining their symbols, values, and spirituality. I believe the position of women in Burkina Faso has regressed. Even in the language there has been a regression in women’s status. I’ll draw a simple example: in African traditions, abandoned girls, homeless girls, did not exist. Certainly they were oppressed because our society has been patriarchal for a long time. Heather: There are still major social problems: girls not going to school or dropping out of school if they become pregnant; child brides, domestic abuse, gender-based sexual violence… Even though women took part in the 2014 uprising to overthrow President Blaise Compaoré, there are still many areas in which they are oppressed here. Aristide: That’s why, as African theatre artists, we should not neglect women. Because if we forget women in theatre today, the theatre of tomorrow will suffer the same problems of excluding them and writing minor roles for them, as it has in the past. This feminism is a political act of inclusion and an opening of the art form to women. With time, people start to understand that theatre, film, and music aren’t worlds reserved solely for men, which is still believed by some people here. It’s strange because in traditional society, the question [of women’s involvement] was never posed; there were griottes—traditional female singer-storytellers. The women played instruments that men weren’t allowed to touch. In modern society, however, there is a monopoly of these roles in the arts for men. There is an exclusion of women from politics, economics, religion, and art. So our theatre has the obligation of readdressing women, of lifting back up their status, of creating balance and equality. And it’s not only up to women to make this happen. The actor with whom I’ve worked the most is a woman: Safoura Kaboré. I have also collaborated for a long time with playwright, actor, and director Odile Sankara, and with French artist Eva Doumbia. All inequality is dangerous. I’ve become very conscious of this, which is why when I develop work, I think about balance. All inequality is dangerous. I’ve become very conscious of this, which is why when I develop work, I think about balance. It became clear to me at a certain point that if there are men, there need to be women; if there are women, there have to be men. 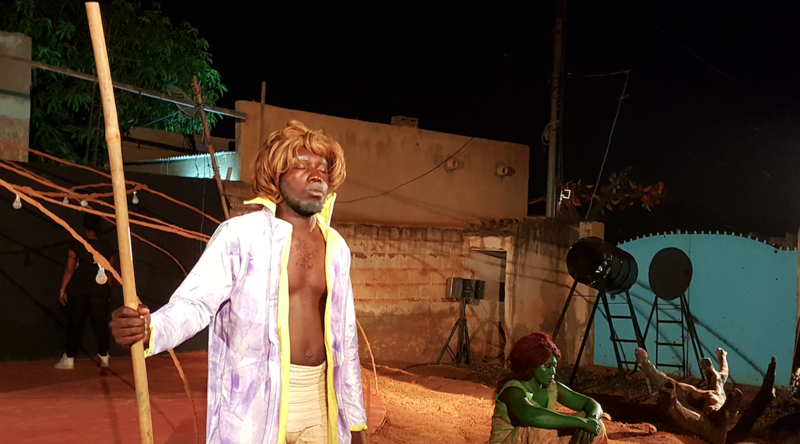 Aristide Tarnagda, directeur artistique des Récréâtrales, le festival du théâtre à Ouagadougou, Burkina Faso, a commencé sa carrière théâtrale en 1999, en tant que comédien, avant de devenir aussi dramaturge et metteur-en-scène. Depuis, il s’est développé en tant qu’artiste grâce à plusieurs travaux, dans plusieurs endroits en Afrique, au Canada, et en Europe ou ses pièces ont était lus et produite. Pendant le PEN World Voices Festival 2018, le Martin E. Segal Theatre Center présente ma traduction en anglais de la pièce Tarnagda Façons d’aimer (Ways of Loving) . Après la lecture, je me suis assise avec Aristide pour parler de son travail en tant qu’écrivain, à propos de l’inclusion des femmes dans le théâtre burkinabé actuel, et du rôle que son festival biennie joue au Burkina Faso. Fondé en 2002, Les Récréâtrales prend place dans un quartier d’Ouagadougou. Les textes y sont développés et mises-en-scène au cours familials – en faisant cela, on amène le théâtre au public. 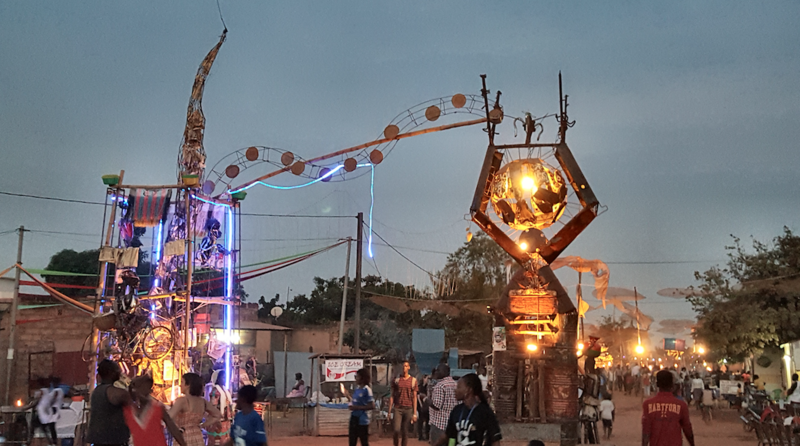 D’autres spectacles qui ont lieu aux centres culturels d’Ouaga, y inclus l’Institut Français et l’Espace Culturel Gambidi attirent des publics composés des Européens, d’autres artistes, des familles et des ami/es ; les publics du festival sont des locaux de tous âges qui n’auront autrement ni accès ni intérêt au théâtre font partis du public. Heather Jeanne Denyer : Depuis que tu as commencé en 2004, tu as beaucoup écrit. Arrêter d’écrire, ce n’est pas une possibilité pour toi, n’est-ce pas ? Aristide Tarnagda : Non, ce n’est pas possible. Mon écriture, elle n’est pas luxueuse. Elle est liée à une nécessité qui est celle de s’enfanter, de se mettre au monde, et aussi de porter une parole qui se veut témoigner de la puissance et de l’impuissance du pays où je vis, de ses rêves. En tant qu’auteurs, nous avons l’obligation de participer à l’enfantement de l’histoire de notre pays. Heather Jeanne : Tu dirais que tu es auteur burkinabé par-dessus-tout, alors. Aristide : Par-dessus tout, oui. Heather Jeanne : Pas un auteur du monde. Aristide : Auteur du monde, oui, mais d’abord, je viens de quelque part. Pour citer Joseph Ki-Zerbo : “L’universel ce n’est pas les nuages, c’est la terre. C’est d’abord le singulier.” C’est parce que je suis burkinabé que je suis du monde. Je me présente comme auteur burkinabé parce que la racine de mon écriture… elle est là. Beaucoup de choses peuvent nous influencer mais mon inspiration vient aussi du milieu dans lequel je vis : où est-ce que je vis, les gens de mon quartier, le paysage de ma ville, les routes, la poussière de Ouagadougou – c’est un ensemble de choses physiques, matérielles et immatérielles. Heather Jeanne : J’ai remarqué l’influence de la musique dans tes pièces, d’ailleurs. Tarnagda : Mais oui. Si je me plonge très, très loin dans mes souvenirs d’enfance, j’aimais beaucoup la musique [de mon pays] ; je voulais faire de la musique. J’étais toujours dans les réjouissances populaires avec les musiciens et les danseurs. Chez les Bissa, [un groupe ethnique Mandé nombrant d’un demi-million au Burkina Faso], il y a un instrument qui accompagne la guitare, le sissiga, j’ai joué à ça tout petit. Donc la musique, c'est quelque chose qui a été toujours été présente dans ma vie. Heather Jeanne : On peut le voir clairement avec les musiciens qui accompagnent les comédiens dans tes pièces. Pour Façons d’aimer, par exemple, présentée au festival Les francophonies en 2015, le musicien, David Malgoubri, a accompagné les deux comédiennes, Safourata Kaboré et Lionelle Edoxi Gnoula sur scène. Aux Récréâtrales en 2016, il y avait d’ailleurs souvent des musiciens dans les mises-en-scènes. Parlons, alors, de ce festival qui occupe une place importante dans ta vie artistique. Tarnagda : Les Récréâtrales, c’est très important parce qu’un artiste, pour grandir, pour aller plus loin, a besoin d’un espace pour s’exercer. Et cela, on l’a beaucoup négligé en Afrique -- des espaces qui permettent aux artistes d’affiner, de faire grandir et de découvrir, sont très, très rares. Donc le festival est un outil important parce qu’il permet à la fois d’accompagner, et de faire voir, “d’exposer” les artistes. C’est l’espace Récréatrales qui m’a permis de véritablement pouvoir m’assoir, d’être tranquille et de me tracer une route, un chemin. C’était un festival comme les autres avant de devenir un évènement avec une identité complètement singulière. Tout le processus de la création se passe sous l’œil du spectateur dans les familles. Ils sont témoins de ce qui se fait. Ils portent, en même temps que les artistes, la création. C’est extraordinaire parce que, pour qui fait-on du théâtre ? On le fait pour les gens. Heather Jeanne : Ils assistent à toutes les étapes de travail – pas seulement à la présentation finale. Tarnagda : Oui, mais, pour citer Saint-Exupéry : “C’est dans les difficultés que l’homme se mesure.” C’est quelque chose d’assez réjouissant parce qu’on tire de l’énergie et de l’enthousiasme sur le visage des gamins qui sont là, qui regardent ; des femmes qui sont là – tu sens l’émerveillement dont je parle. Ils vivent le beau. Et tu sens tout d’un coup que c’est nécessaire. Heather Jeanne : Ce ne sont pas les spectateurs de tous les jours, qui vont normalement au théâtre. Tarnagda : Voilà. Et ça, c’est magnifique. Heather Jeanne : Quand je discutais des problèmes de manque de public avec des artistes au Bénin et au Togo, on me dit toujours qu’il faut créer un nouveau public qui a l’habitude d’aller au théâtre, parce que si on n’en a pas l’habitude dès un jeune âge, on ne va jamais commencer. Tu crois, alors, que ce festival aide avec ça ? Tarnagda : Bien sûr. C’est le fait de créer une communauté qui est important. C’est quand-même 3,000 spectateurs par jour pendant le festival. Heather Jeanne : Ça aide à changer des idées par rapport à l’importance du théâtre et de l’art dans la vie ? Tarnagda : Ah oui ! Et on le voit déjà. Il y a un œil de spectateur qui se met en place ; il y a un regard, une critique. On commence à donner son point de vue sur un spectacle. Les gens commencent à être exigeants. Et c’est de cette façon que le théâtre est politique. Et du coup, comme ils commencent à être exigeants, ils commencent eux-mêmes à constituer le public du théâtre. C’est comme ça que ça se construit : par effet de contagion, ils vont contaminer les autres, et finalement, ça se disperse partout dans la ville. Heather Jeanne : Tu fais, alors, des efforts pour parler à propos de la politique dans ton théâtre, et ainsi d’ouvrir des discussions au public ? Tarnagda : Oui, c’est une discussion sociale, le théâtre. Quand on écrit une pièce, c’est un prétexte au rassemblement en vue d’échanger des idées. C’est quand on parle de nos réalités qu’on les transcende. On crée une communauté, et surtout, on crée des liens entre les gens. Pour que les gens viennent se réunir, il faut que l’objet qui les réunisse les concerne, les intéresse, leur parle. Par exemple, avec mon texte, Sank, ou la patience des morts, c’était [pour moi] fondamental d’interroger cette histoire-là. [Cette pièce de théâtre, sortie en 2016, traite sur les relations entre l’ancien chef d’état socialiste Thomas Sankara et son camarade-en-armes/assassin, l’ancien président, Blaise Compaoré.] En tant qu’auteur, j’avais le devoir de l’interroger, et de partager cette interrogation avec les habitants du Burkina Faso, et ensuite, avec le reste du monde, pour qu’on s’approprie notre histoire, pour que nous analysions notre histoire, que nous la prenions en charge. Heather Jeanne : J’ajouterais que Terre rouge (2011) – l’échange des lettres entre deux frères, l’un en Europe et l’autre en Afrique – ça aussi, c’est un texte politique. Tarnagda : J’aime toujours mêler l’intime et la politique. Parce que l’intime permet d’ouvrir. Dans Terre rouge, il s’agit de deux frères qui se parlent. La plupart des gens ont des frères et des sœurs. Donc ils se retrouvent tout de suite concernés par ce dont on parle. D’une façon, c’est comme si on raconte des histoires qui interpellent les spectateurs, les histoires dans lesquelles ils se reconnaissent. Heather Jeanne : Par contre, d’autres textes comme De l’amour au cimitère (2006) ou Et si je les tuais tous, Madame ? (2012) ont l’air un peu plus généralisé, même s’ils lancent des discussions. Ils parlent des relations humaines, de la vie et de la mort avec une certaine urgence, même si les détails de la scène et des personnages ne sont pas aussi précisés que dans le texte de Sank. Tarnagda : Oui, ce n’est pas la destination qui est importante ; c’est le chemin. C’est l’ici, le maintenant qui est le plus important, qui interpelle et qui capte. J’ai toujours ancré mes personnages dans des situations effectivement d’urgence où ils doivent opérer des choix. Où ils doivent assumer, s’assumer. Ils doivent assumer leurs destins. Ils ne peuvent pas être indifférents. C’est-à-dire, on ne peut pas être observateur et spectateur de sa propre vie. Bon, la plupart du temps, ça se finit mal dans mes pièces. Pas de “Happy End”. Ceci est pour ouvrir le champ du possible, le champ de la discussion, bref le champ de la complexité. Heather Jeanne : C’est évident dans la pièce Façons d’aimer où il s’agit d’une femme qui se présente devant le juge qui a le pouvoir de vie ou de mort sur elle, après qu’elle ait avoué avoir tué son mari et sa quatrième femme – une femme blanche. Dans ce cas, c’est très politique tout simplement parce que le personnage central c’est une femme et une meurtrière et une gauchère – ce qui est tabou en Afrique de l’ouest. Au même temps, elle est symbole pour le pays, le Burkina Faso, et bien pour toutes les femmes burkinabées. Quand même, et la protagoniste et sa mère sont beaucoup plus complexe et développées que la plupart des personnages de femmes dans les pièces de théâtre écrites au vingtième siècle. Je veux dire, les comédiennes avaient l’habitude de jouer soit “la femme,” soit “la mère,” ou bien, “la fille” de quelqu’un nommé. Dans ces cas, dans le théâtre d’hier, il n’y avait pas d’ouverture pour traiter sur des thèmes sociaux qui concernent les femmes. Ton théâtre actuel, par contre, ça s’en occupe fortement. Aristide : La situation dans laquelle sont les femmes burkinabées, c’est exactement la situation dans laquelle sont nos différents pays. Ce sont des pays déstructurés et perdus qui sont en train de se reconstruire et de redéfinir les symboles, les valeurs, la spiritualité. Quand on écrit une pièce, c’est un prétexte au rassemblement en vue d’échanger des idées. C’est quand on parle de nos réalités qu’on les transcende. Moi, personnellement, je pense que la situation de la femme a régressée. Même dans le langage il y a eu une régression de la stature de la femme. Je prends un exemple très simple : dans l’Afrique traditionnelle, des filles abandonnées, des filles de rue, ce n’est pas quelque chose qui existait. Certes, elles étaient opprimées parce que depuis très longtemps, la société est patriarcale. Heather Jeanne : Il reste toujours des problèmes sociaux assez graves : des filles qui ne vont pas à l’école – ou bien, qui le laissent tombé quand elles tombent enceintes. Des enfants mariées et mères ; la violence domestique et la violence faite aux femmes en générale… Malgré le fait que les femmes ont marché dans les rues pendant la Révolution de 2014 contre l’ancien président, Blaise Compaoré, il y a quand-même plusieurs niveaux d’oppression qui persistent. Aristide : C’est pour cela qu’au théâtre, nous ne devons pas oublier la femme. Parce que si on oublie la femme au théâtre d’aujourd’hui, le théâtre de demain souffrira des mêmes problèmes d’exclusion, des rôles non-développés, comme dans le passé. Ce féminisme c’est un acte politique pour inclure et ouvrir le théâtre aux femmes. Avec le temps, les gens commencent à comprendre que le théâtre, le cinéma, la musique, ce ne sont pas des mondes réservés uniquement aux hommes, comme des gens d’ici continuent à croire. Ce qui est étrange parce que dans la société traditionnelle, la question [de l’inclusion des femmes] ne se posait pas parce qu’il y avait des cantatrices et des griottes. Les femmes avaient des instruments auxquels les hommes ne touchaient pas. Dans la société moderne, par contre, dans les arts, il y a un monopole des rôles par les hommes, il y a eu une exclusion des femmes : du champ politique, du champ économique, du champ religieux, du champ artistique. Donc notre théâtre a l’obligation de redresser, de relever le niveau de la femme, de créer l’équilibre et l’égalité. Et ce n’est pas uniquement aux femmes de le faire. Moi, par exemple, l’acteur que j’ai le plus accompagné, c’est une femme : Safourata Kaboré. J’ai tout un accompagnage artistique avec Odile Sankara, du Burkina, et avec Eva Doumbia en France. Tout déséquilibre est dangereux. J’ai conscience, c’est pour ça que quand je du beau, je suis un peu dans la parité. Tout déséquilibre est dangereux. J’ai conscience, c’est pour ça que quand je du beau, je suis un peu dans la parité. A un certain moment donné, il faut que quand il y a des hommes, il y a des femmes ; quand il y a des femmes, il y a des hommes.